A galette is basically a nice French word loosely describing a loose little combination of pastry and something else. I tend to think of it as an informal pie — rather than confining your pastry to a pan, you place the fruit on a piece of dough and fold the dough around it to form a quaint little nest filled with fruit. Maybe they're left over from an extinct orchard; maybe they grew from a seed dropped by a hungry bird or deer or raccoon; the mysteries abound. But I only cared for their flavor and texture, which I liked, so we picked a bagful. Soon they'd been patiently waiting in the pantry for a day, and I had a few hours to spare and guests for the feeding. Using an extra double-crust pie I'd made the previous weekend (these will keep in the fridge for a week or more, and frozen for up to a month), I made two little galettes — one with Cabot cheddar, one without. I served them for dessert at a Sunday supper and for an afternoon snack the next day. 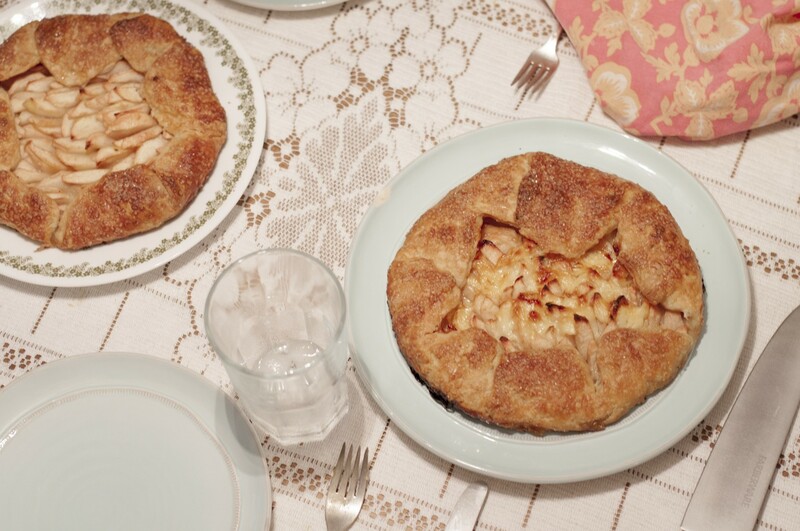 The great thing about an apple-cheese pie is that it's dessert, breakfast, lunch or a snack. *There's an excellent crust recipe at the very bottom of this post about Concord/wild grape pie. **For variety’s sake, you can make one cheesy-apple galette and one with apples only; if you do that, you’ll only need about half a cup of cheese. ***Mix one egg with half a cup of water until smooth. Have ready and refrigerated one all-butter crust for a double-crust pie, divided and rolled into two rounds, just shy of a quarter-inch thick. 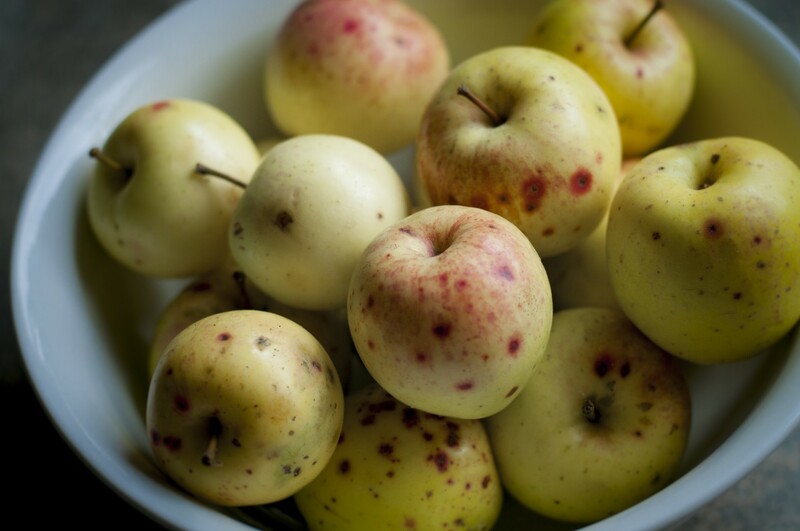 As you peel and cut the apples, place them in a mixing bowl with enough water to cover them and the juice of one lemon. In a separate, smaller bowl, mix the sugar and spices. Drain the liquid from the apple bowl, add the sugar/spice mixture, and mix gently but thoroughly with a large spoon or rubber spatula. Remove one crust from the fridge and scallop the edges with a knife. Place the crust on a large, buttered rimmed cookie sheet or pie tin, and layer apples and cheese into the middle of the crust, leaving no less than three inches of free dough around the outside. Take care to layer the apples tightly so they overlap without any gaps filled with just cheese; big chunks of cheese will leave an empty space as they melt during baking. Fold the scalloped edges of the crust inward so they form a nice pocket around the fruit and place in the fridge while you build the other galette. When both pastries are ready, brush both with egg wash, sprinkle with demerara sugar and bake in the oven for 15 minutes until the crusts set and begin to brown. Reduce heat to 350 degrees and bake another 30 to 45 minutes until the crusts are a deep golden-brown.